UFC lightweight champion Khabib Nurmagomedov and Conor McGregor appear to be headed for another collision course in 2019. Now that doesn’t necessarily mean they’ll be fighting each other next but according to UFC president Dana White he does expect that rematch to happen this year. That’s not exactly a surprise given the immense success of the first pay-per-view card featuring Nurmagomedov and McGregor that became the biggest UFC show of all time. Nurmagomedov ultimately submitted McGregor with a fourth round rear naked choke before the Russian leapt over the cage to go after his opponent’s corner men, which set off a huge melee in the arena. The culmination of that action will lead to a hearing with the Nevada State Athletic Commission in early 2019 but once punishments are handed down, both fighters are expected to get back into action sooner rather than later. It’s still not determined if Nurmagomedov will face McGregor again straight away but all sights point to the fight happening again at some point in 2019. 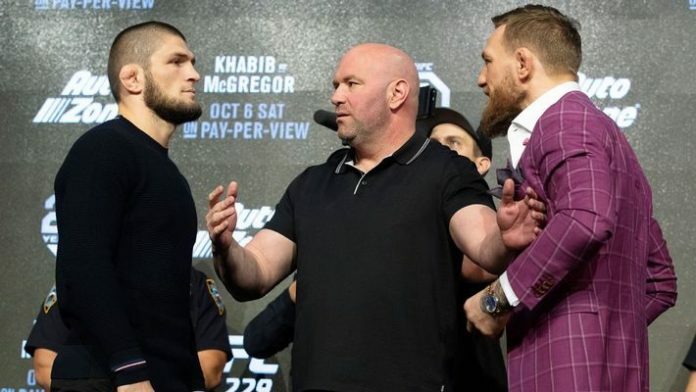 What still has to be decided is the possibility that the UFC moves forward with separate fights for both Nurmagomedov and McGregor before putting them back together for a rematch. Former interim lightweight champion Tony Ferguson appears to be the most logical choice to face Nurmagomedov next, but that fight has been scheduled and cancelled on four separate occasions in the past. Still, Ferguson has been on a tear over the past few years and denying him the next shot at the title would seem egregious. Meanwhile, McGregor has a few options available to him including a trio of potential rematches against Nate Diaz, Dustin Poirier or current featherweight champion Max Holloway. Any of those scenarios could play out or the UFC could just decided to put Nurmagomedov back in the cage against McGregor and cash in immediately rather than risking that either one of them could lose, which would obviously delay any rematch. Are you excited about a potential Khabib Nurmagomedov vs. Conor McGregor rematch? Sound off in the comments and let us know!